The Asian Institute of Technology (AIT) is the gateway for students to become global citizens. While in the past, the Institute was an agency for regional development, today it has emerged as a platform for global cooperation. These were the welcome remarks of AIT President Prof. Worsak Kanok-Nukulchai at the orientation day event organized on 3 August 2018. Reminiscing the day, when in 1971, he was a student at AIT, Prof. Worsak stated that AIT was a place where students work hard, enjoy life in a beautiful campus, savor the environment, and create lifelong friendships. 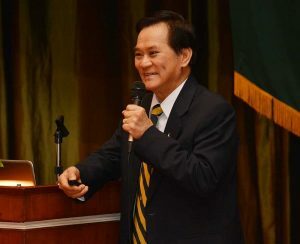 Informing students about the history of the Institute, Prof. Worsak stated that though the land was gifted by Thailand, AIT is an international, independent and a non-profit organization. He stressed that unlike other institutes where research is conducted only for economic gain, AIT focuses its research to create a sustainable future for mankind. 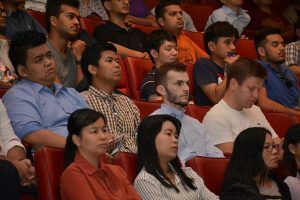 The August 2018 batch of students has over 400 students hailing from 25 countries, with host country Thailand being the home of a little over a quarter of the students. Europe is represented by France, Germany, Finland and Lithuania, North America is represented by Canada, Africa by Morocco, and Oceania by Papua New Guinea. Students from Asia come from Afghanistan, Bangladesh, Bhutan, Cambodia, India, Indonesia, Japan, Maldives, Myanmar, Nepal, Nigeria, Pakistan, Philippines, Sri Lanka, Maldives, Thailand Timor-Leste, and Viet Nam. Students were also welcomed by Prof. Sivanappan Kumar, Vice President for Academic Affairs; Prof. Voratas Kachitvichyanukul, Dean of School of Engineering and Technology (SET); Prof. Rajendra Shrestha, Dean of School of Environment, Resources and Development; Dr. Vimolwan Yukongdi, Faculty Director of MBA Program at the School of Management; Mr. Pauk Kyaing Sahm, President of the AIT Students’ Union, and Ms. Laarni B. Roa, Director, Office of Student Affairs. They were introduced to Academic Regulations, Services and Facilities by Dr. Tenzin Rabgyal, Coordinator, Admissions, Scholarships and Invoicing Unit, Office of Student Affairs; Language Center Services and English Language Requirements by Ms. Thanisa Choombala of Language Center; Academic Requirements and Practices by Ms. Laarni B. Roa, Director, Office of Student Affairs; Career Center and Student Welfare by Ms. Carla Gonzales, Coordinator, Career Center and Student Welfare Unit, Office of Student Affairs; Campus-wide IT Services and Policies by Dr. Harianto, IT Consultant; Facilities Management and Accommodation Policies by Wanchai Sophonsakulrat, Director, Office of Facilities and Assets Management; and Educational Visa and Government Relations Services by Suda Inta, Senior. Government Officer, Government Relations Unit, Office of Host Country Relations.